In 2016 Colten Boushie, a young Indigenous man, was shot and killed on a farm in rural Saskatchewan, inciting racial tensions across the province. This is the story of that man and the white farmer, Gerald Stanley, who was charged in his death. This episode looks at how the shooting, trial and verdict have changed the conversation around reconciliation in Canada. It asks what people think the aftermath says about the country and where the conversation needs to go next. This episode explores the debate around jury selection reform in the wake of the not guilty verdict in Gerald Stanley's second-degree murder case, and asks whether the Canadian justice system needs to change. This episode goes through the jury’s verdict in Gerald Stanley's second degree murder trial, and the national reaction it triggered. This episode goes through the second week of Stanley's murder trial as Stanley's defence team makes its case. It details Gerald Stanley's testimony about what happened on the farm the day Boushie was killed and explains why he’s calling it a freak accident. This episode goes inside the courtroom during the first week of Stanley's murder trial as witnesses — including Gerald Stanley's son and Boushie's friends — testify about what they say happened on the farm the day Boushie was killed. In 2016, Colten Boushie, a young Indigenous man, was shot and killed on a farm in rural Saskatchewan. 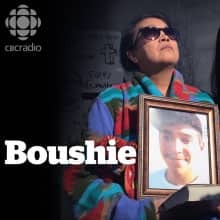 This episode explains how Boushie's death turned into a movement to end racism, while — at the same time — sparking hundreds of racist and violent messages. In 2016 Colten Boushie, a young Indigenous man, was shot and killed on a farm in rural Saskatchewan, polarizing the province along racial lines. In this episode we'll tell you what we know about that man and the night he was killed. We'll also tell you about the white farmer, Gerald Stanley, who was charged with Boushie's death.